Recipe for Tropical Smoothie Popsicles, fresh blend of tropical flavors with a granola crunch, all packaged nicely into a popsicle. Papaya, pineapple, banana, and coconut blended with honey in a greek yogurt base topped with granola. Tropical fruits are harvested in hot humid areas closest to the equator. In a blender combine papaya, banana, and pineapple and blend until smooth. Whisk together greek yogurt, coconut milk, honey, and vanilla in a separate bowl. Spoon fruit blend into 5 popsicle molds, filling only halfway. Then add yogurt blend just below the top. Take a skewer and give one stir to create a swirl. 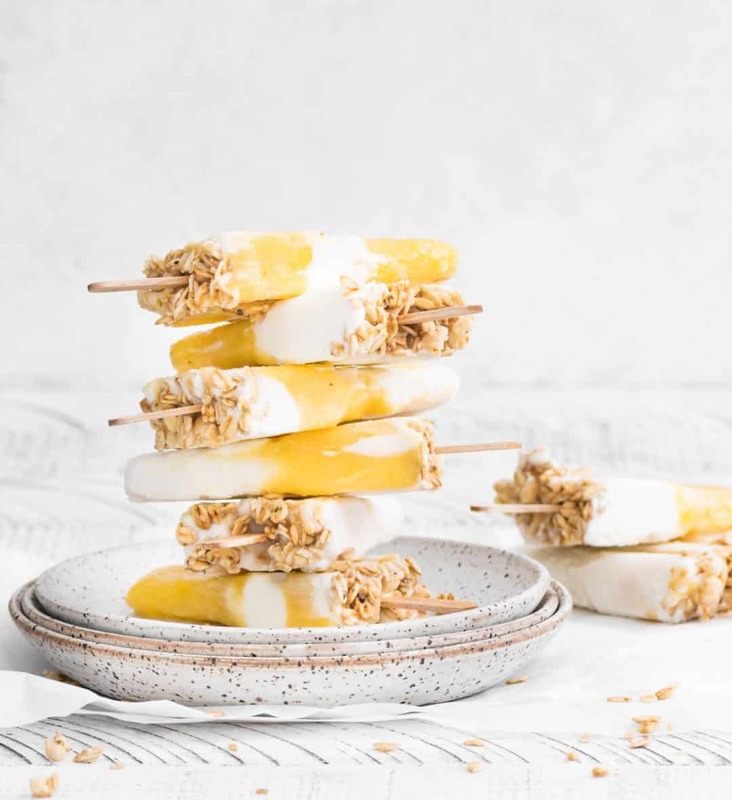 Sprinkle granola on top and gently press into the popsicle mixture. Repeat with the remaining 5 molds, starting with yogurt halfway and then adding the fruit blend. Top with granola. Place the lid onto your popsicle mold and gently slide your sticks into the designated slots. Don’t push all the way down, leave about a half inch of stick protruding from the top. If you push all the way down there will be less room for you to hold your popsicle. Place mold into the freezer for at least 4 hrs. or overnight. When you are ready to remove your popsicles, gently run a little warm water around the bottom of the molds. (opposite of stick side) This should loosen them just enough to slide out. Enjoy your taste of the Tropics! Ha Yes! Yah for warm weather and tropical flavors!